The Transatlantic Trade and Investment Partnership (TTIP) is the biggest trade deal ever negotiated. Yet all British MPs know about it is what little the European Commission (EC) decides to tell them -- and that's about to become a lot less. Last week German website Correct!v revealed that one of the only sources of information for what happens in secret TTIP negotiations will end. The EC will now no longer send updates of TTIP talks to national governments or parliaments. This means that the only way an MP can know what's going on inside TTIP negotiations is to travel to Brussels to gain access to documents in a special, secure reading room. 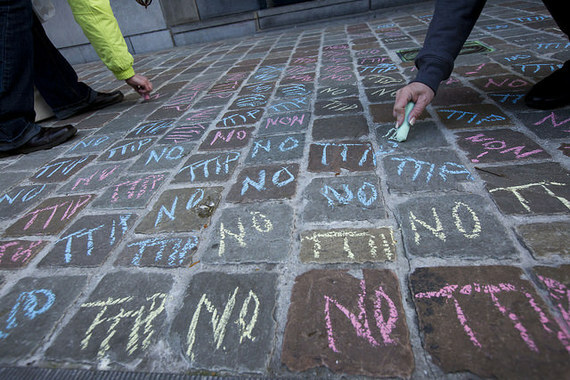 More than 2.4 million people have signed a petition against TTIP. So it's little wonder that politicians are unhappy that they are being prevented from easily accessing the details of such a controversial trade deal. Some have pointed out that this represents a significant expense for limited budgets; others have rightly pointed out that they wish to share paper copies with stakeholders. The UK has stayed silent, but the German government called the move "counterproductive," with national parliamentarian Klaus Ernst adding that Members of the European Parliament (MEPs) must be able to access all documents: "The EU Transparency PR is, against this background, just ridiculous." The EC repeatedly talks up its supposed commitment to TTIP transparency. However, as the EU ombudsman highlighted, we're still not allowed to know what the US is asking for or how lobbyists are influencing the process through meetings with trade officials. And we won't get to see the "consolidated texts" which will form the treaty itself until it's too late to change them. MEPs can see some TTIP texts. First, they have to book an appointment to visit an EC or US Embassy reading room. Then they must sign a 14-page non-disclosure agreement and hand in all electronic devices. Finally, they have to be accompanied while they read TTIP documents. Only two days before Correct!v's revelation Wikileaks launched a crowdfunding campaign to raise a E100,000 (about £70,000) bounty for leaked TTIP texts. In less than a week, some 70 percent of the total has been reached with Vivienne Westwood, Daniel Ellsberg and Yanis Varoufakis among the contributors. In light of what we know, the response to Wikileaks from EC Trade Commissioner Cecilia Malmstrőm and the EU "TTIP team" highlighted a blasé attitude to genuine transparency. Our parliamentarians must not allow us to walk blindfolded into a trade deal that threatens 1 million job losses and a new 'corporate court' system so big business can sue governments when policy-making threatens future profits. But unless we all stand up and shout out about this travesty of democracy that is exactly what the EC will try to force us to do.